Senate Majority Leader Mitch McConnell said he thought of one person when the long-held Republican promise to repeal and replace Obamacare went up in flames: Hillary Clinton. 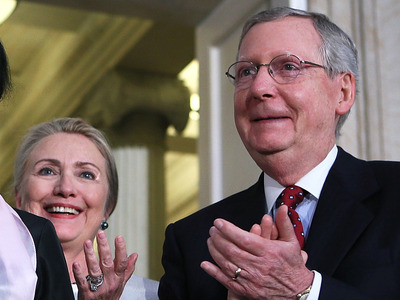 The Louisville, Kentucky-based NPR affiliate WFPL reported McConnell told attendees of Fancy Farm — an annual Kentucky event — that he took solace in the fact that Clinton wasn’t president following the stunning defeat of the Senate plan to repeal Obamacare. “I choose not to dwell on situations where we come up a little bit short,” McConnell said, according to WFPL. Despite controlling the House, Senate, and White House, the GOP failed to deliver on the “dream” after months of debate on a variety of plans that formed serious divides within the party. The final blow came from Republicans in the Senate, who came up short on various healthcare proposals. Following the defeat of a full-blown repeal-and-replace plan and a wholesale repeal-only bill, three GOP senators — Susan Collins, Lisa Murkowski, and, most dramatically, John McCain — all voted against the so-called “skinny repeal” plan that would have eliminated certain aspects of Obamacare. The failure appears to be the death blow for the GOP’s aspirations of passing a repeal-and-replace bill. Most senators have moved on discussing possible bipartisan fixes for Obamacare or shifted to other issues, like tax reform, the budget, and the debt ceiling. Clinton had a similar failure on healthcare healthcare during her tenure as first lady, when she took the lead on reform efforts but saw her proposal was defeated by Republicans in Congress.